•	The Danish state is one of the company’s shareholders, through the Danish Investment Fund for Developing Countries (IFU) and its Danish Agribusiness Fund (DAF). •	After touring the Maule Slaughter Plant and the Pork Production Center “San Agustín del Arbolillo” in San Javier, the diplomat described Coexca as a very successful and growing company. 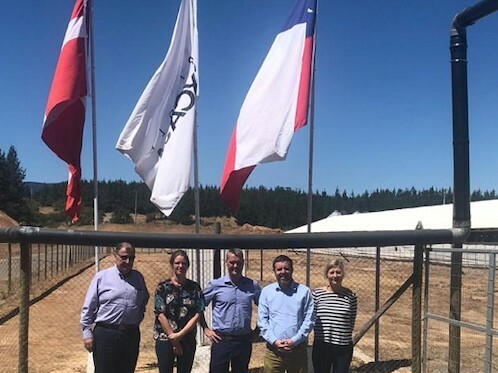 In order to learn about its business project and development plans, the recently appointed Ambassador of Denmark in Chile, Jens Godtfredsen, visited Coexca, a company partly-owned by the Danish state via an investment fund. The diplomat was accompanied by Claudio Soler and Helle Bjerre, members of Coexa’s Board, and its General Manager, Guillermo García. The group toured the facilities of the company, in particular the Maule Slaughter Plant and the Pork Production Center “San Agustín del Arbolillo.” The center, located in the municipality of San Javier, is one of the most modern and sustainable centers in Latin America. During his visit, the Ambassador learned more about the high standards of pig breeding, the sustainability measures implemented by the company, and the development model of the center, which occupies 1000 hectares in the inland, dry area of the Maule region. At the company’s slaughter plant, where value-added products exported to over 35 countries are manufactured, the diplomat toured the facilities and learned about the main projects the company is currently working on in order to respond to demanding markets such as Japan, China and South Korea, where their products are sold. The Ambassador of Denmark in Chile was impressed by the development of the company, partly-owned by the Danish state via the Investment Fund for Developing Countries of Denmark (IFU) and its Danish Agribusiness Fund (DAF). “The goal of my visit is to learn about a significant investment made by IFU. It is very important for me to witness how successful this investment has been. For Denmark, pig production is very important (…) Everything I have seen is impressive. Coexca is a growing and very successful company that adapts, uses modern technology, is aware of environmental standards and implements standards that are stricter than what is required by law,” he said. He added that it is of utmost importance for him to learn about areas of potential collaboration from Denmark with other countries to obtain a sustainable pork production. The diplomat also announced a future visit of a delegation of Danish businesspeople related to the sector in order to learn about the Chilean experience in pork production. It is another example of foreign investment in Chile and the trust of one of the main pork producers worldwide in the Chilean industry, which allows us to create positive synergies with their market. For his part, Coexca’s General Manager, Guillermo García, appreciated and thanked the visit of Ambassador Jens Godtfredsen, as it allows him to learn first-hand about the company’s plans, the actions it has taken in different areas as part of its development project, its work systems and the various certifications that have allowed it to access demanding markets throughout the world. “Coexca is growing steadily. It is a company with integrated operations from food production, pig breeding, and logistics, to the final consumer. In 2017, the Investment Fund for Developing Countries of Denmark (IFU) acquired part of Coexca’s property, a milestone for the industry and the country. We are pleased with the visit of the Danish ambassador in Chile because it was one of the first he has carried out in the country after taking office,” he said. 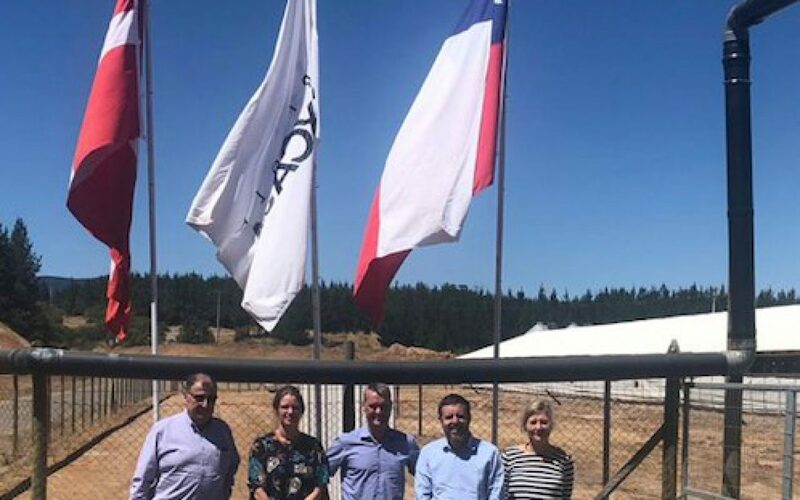 The diplomat’s visit concluded with a meeting in Talca with Coexca’s managers, staff and special guests, providing an opportunity for him to enjoy a pleasant talk with community leaders from the town of Sauzal, 12 kilometers away from the “San Agustín del Arbolillo” production center. On this occasion, local residents, chaired by Maricel Orellana, thanked the ambassador for the support the company has given to various community initiatives within the framework of its corporate social responsibility policy, and they invited him to visit their traditional village in the inland, dry area of Maule in the near future, a gesture that he appreciated and hopes to make a reality soon. It should be noted that the Investment Fund for Developing Countries of Denmark (IFU), via its Danish Agribusiness Fund (DAF), came in as a new shareholder of Coexca almost two years ago, constituting an unprecedented alliance in the Chilean pork industry. DAF’s providers belong to the Government of Denmark and Danish pension funds. In fact, IFU is managed by a board of directors appointed by the Danish Ministry of Foreign Affairs. The Ambassador of Denmark in Chile, Jens Godtfredsen, with Claudio Soler and Helle Bjerre, members of Coexca’s Board of Directors, and its General Manager, Guillermo García. The diplomat with one of the animals bred in San Javier. The diplomat with company executives and the company Director, Helle Bjerre. The Ambassador of Denmark in Chile, Jens Godtfredsen, with community leaders of the town of Sauzal, headed by the President of the Neighborhood Council, Maricel Orellana.